The Seton Hill University Theatre and Dance Program will present Clybourne Park by Bruce Norris, February 22 to March 2 in the William Granger Ryan Theatre, Performing Arts Center, 100 Harrison Avenue, Greensburg, Pa. Tickets are $15, with student and group rates available. A reception with the cast and crew follows the opening night performance on February 22. Following the performance on Sunday, February 24, a panel led by Seton Hill General Counsel Imogene Cathey will discuss the play's topics of gentrification, fair and affordable housing, accessibility of transportation to jobs, and access to nutritional food for low-income individuals. Panelists include Kathryn Daczka, Esq., an attorney with the Fair Housing Law Center; Crystal Jennings, Housing and Transit Organizer for Pittsburghers for Public Transit; and Karen Harouse-Bell, Director of the Nutrition Coordinated Program at Seton Hill. Call the Seton Hill Performing Arts Center Box Office for tickets at 724-552-2929 or purchase tickets online at www.setonhill.edu/tickets. Performances: February 22, 23, March 1 and 2: 8 p.m.; February 23, 24 and March 2: 2 p.m. In 1959, a white couple sells their home in Clybourne Park Chicago to a black family - the first to move into the neighborhood. In 2009, a white couple moves into the same home in a predominantly black neighborhood in a wave of gentrification. Bruce Norris’s comedy looks at two generations of homeowners whose choices threaten the boundaries drawn by property and race in this biting satire and winner of the Pulitzer Price and Tony Award for Best Play. Please Note: This show contains adult language that some audience members may find offensive. The Seton Hill student cast of Clybourne Park includes Nicole Castelli of Canonsburg, Pa.; Stacey Fils of Boardman, Ohio; Liam Johnston of New Kensington, Pa.; Layne Lueckert of Donegal, Pa.; Malcolm McGraw of Pittsburgh, Pa.; Travis Miller of Greensburg, Pa.; Cameron Nickel of Bethel Park, Pa.; and Frankie Weber of Elizabeth, Pa. The Seton Hill student technical staff includes Katie Adler of Springdale, Pa., scenic paint and props crew; Madyson Baer of Lewisberry, Pa., light board operator and production electrician; Catherine Balaban of North Huntingdon, Pa., staff electrician; Ashley Blazczak of Saxonburg, Pa., costume shop crew; Cassie Brugos of West Mifflin, Pa., production electrician; Natasha Byer of Bedford, Pa., carpenter; Brooke Caldwell of Cambridge Springs, Pa., scenic paint and props crew; Kailey Campbell of Annapolis, Md., scenic paint and props crew; Molly Carbone of Allentown, Pa., hair and make-up manager and carpenter; Bayley Clark of Charleroi, Pa., production electrician; Brittany Dilliot of Arnold, Pa., costume shop crew; Julianna Eyer of Pittsburgh, Pa., assistant stage manager and costume shop crew; Stacey Fils of Boardman, Ohio, staff electrician; Bridget Forsythe of Pittsburgh, Pa., student house manager; Sydney Fulton of Freeport, N.Y., carpenter; Amy Hotovchin of Elizabeth, Pa., costume shop crew; Diante Jackson of Greensburg, Pa., costume shop crew; Audrey Johnson of Greensburg, Pa., carpenter; Liam Johnston of New Kensington, Pa., carpenter and run crew; Lance Joos of Pittsburgh, Pa., scenic paint and props crew; Rebekah Kephart of New Kensington, Pa., costume shop crew; Madeline Kocur of Oakmont, Pa., carpenter; Evan Kohnstam of Herndon, Va., sound board operator and carpenter; Julie Lang of Pittsburgh, Pa., wardrobe manager; Kristina Lindauer of North Versailles, Pa., assistant stage manager; Jessie Malone of Ruffsdale, Pa., scenic paint and props crew; Jordan Mayers of New Park, Pa., scenic paint and props crew; Kaitlyn Mayers of New Park, Pa., carpenter; Elizabeth Miller of Pittsburgh, Pa., costume shop crew; Travis Miller of Greensburg, Pa., carpenter; Heather Mirenzi of Pittsburgh, Pa., costume shop crew; Sydney Molter of Jeannette, Pa., costume shop crew; Johanna Nimmer of Libertyville, Ill., dramaturg and costume shop crew; Breanna O’Brien of North Huntingdon, Pa., stage manager and staff electrician; Azaria Oglesby of Catonsville, Md., costume shop crew; Giordanna Paola of Ligonier, Pa., hair and make-up stylist; Isabel Papariella of Pittsburgh, Pa., carpenter; Tyler Parsonage, an intern from Franklin Regional High School, scenic paint and props crew; Lilli Real of Pittsburgh, Pa., costume shop crew; Julia Stypula of Mars, Pa., production electrician and dresser; Ashlynn Swauger of West Newton, Pa., master carpenter and dresser; Riley Tate of Munhall, Pa., carpenter; Hannah Taylor of Wexford, Pa., production electrician and run crew; Noah Telford of Greensburg, Pa., carpenter; Emma Walther of York, Pa., costume shop crew and carpenter; Jacob Westwood of Irwin, Pa., costume shop crew and Julia Wingard of Pittsburgh, Pa., carpenter. The Seton Hill University production of Clybourne Park is directed by Denise Pullen. A member of the Seton Hill University Theatre and Dance faculty since 2002, Denise teaches performance and playwriting classes throughout the curriculum. Her recent directing at Seton Hill includes the musicals Nine and Sweet Charity. Denise is a Pittsburgh area playwright, screenwriter, theatre director, voice actor, and educator. Her play Running in Traffic was developed and produced in 2012 at Seton Hill University. Denise received a 2000 Sloan Foundation Award for her screenplay Riding Fire. She is the recipient of two Pennsylvania Council for the Arts Fellowships. She earned her BFA in Directing and MFA in Dramatic Writing from Carnegie Mellon University, where she teaches playwriting and drama lit for their Drama Pre-college Program. Professional artistic staff for the production includes Ken Clothier, assistant professor of theatre, lighting design and sound design; Alicia DiPaolo, house manager; Karen Glass, assistant professor of theatre, charge scenic artist, set design and properties manager; Elaine Montgomery, costume shop manager; Susan O’Neill, instructor of theatre, costume director; Miriam Patterson, adjunct instructor of theatre, costume design; Katya Shaffer, box office manager; Terra Skirtich, adjunct instructor of theatre, costumer; Kellee Van Aken, chair of theatre and dance and associate professor of theatre, artistic director; and Caila Yates, technical director. Venue Information: All Seton Hill Theatre performances are held in the William Granger Ryan Theatre in Seton Hill’s Performing Arts Center, 100 Harrison Avenue, Greensburg, Pa. The Performing Arts Center is a fully accessible and climate-controlled facility. Parking is available in four nearby Greensburg parking areas: the Bell Parking Garage on North Otterman Street (across the street from the Performing Arts Center), the Hellman-Ghrist lot on North Main Street, the Albert Grillo lot on Seton Hill Drive and the Wib Albright lot off West Otterman Street. Ticket Information: Single admission tickets are $15. Seton Hill students (with valid ID) can purchase tickets for $5. Non-Seton Hill students (with a valid school ID) can purchase advance tickets for $10. Students from any school can purchase rush tickets five minutes before curtain, subject to availability, for $5 (with valid school ID). Groups of six or more can purchase tickets at a rate of $10 each with a reservation and advance payment. Order tickets online at http://www.setonhill.edu/tickets by phone at 724-552-2929, or by mail at SHUPAC Theatre Box Office, Seton Hill University, 1 Seton Hill Drive, Greensburg, Pa. 15601-1599. Box Office Hours, by telephone: 11 a.m. – 6 p.m., Monday through Friday. Extended hours on performance days: 11 a.m. – 8 p.m. Thursday-Saturday and 10 a.m. – 2 p.m. Sunday. 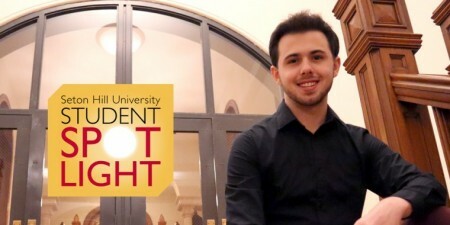 Seton Hill University’s Performing Arts Center is 73,000 square feet of everything a performing arts major needs to move from student to professional. The Center houses two dedicated, flexible performance spaces, the Carol Ann Reichgut Concert Hall and the William Granger Ryan Theatre. The Center also includes a performance studio, new classrooms, rehearsal rooms and technical areas that include the best equipment for learning and performing, from Steinway pianos to the latest in lighting, sound, video and acoustics. The Center is located in downtown Greensburg, putting it squarely in the middle of the city’s cultural district yet still only minutes from Seton Hill’s main hilltop campus. 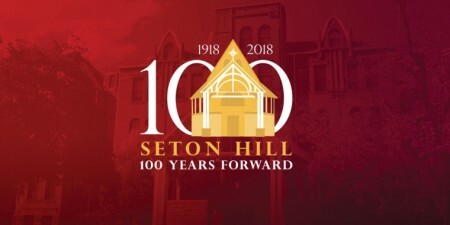 The Seton Hill University Theatre and Dance Program has a long history of educating performing arts majors for professional careers while playing a vital role in the educational life of the campus. Seton Hill’s Theatre and Dance Program offers four full-length productions (as well as a number of shorter works) each year that generate audiences of over 3,500 and speak to topics addressed in courses across Seton Hill’s curriculum. For more information on the Theatre Program at Seton Hill, please visit www.setonhill.edu or call 724-552-2934. PHOTO: Malcolm McGraw, Stacey Fils and Frankie Weber in the Seton Hill University production of Clybourne Park.